That swarm provided the perfect introduction. We drew bumble bees, wasps and honey bees so that they could distinguish between them. 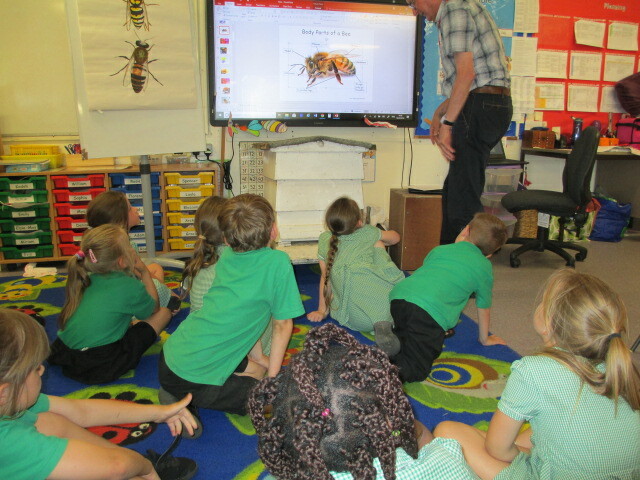 Then, with the children sitting on the floor, we talked about the relationship between bees and plants, the life cycle of the colony and what goes on inside a beehive, all illustrated by Powerpoint. 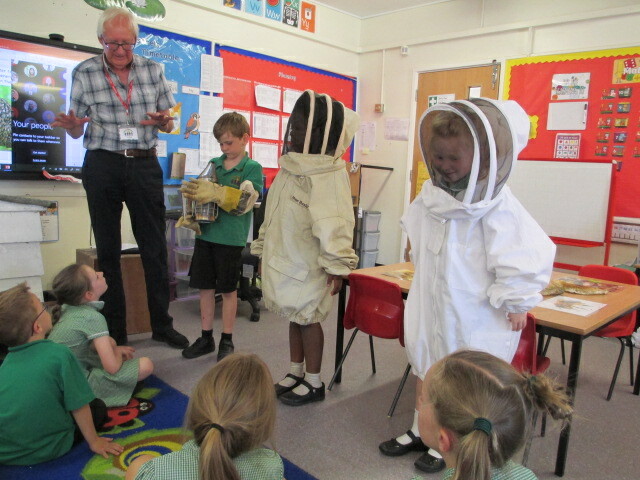 Some of the children dressed up as beekeepers, which was great fun. 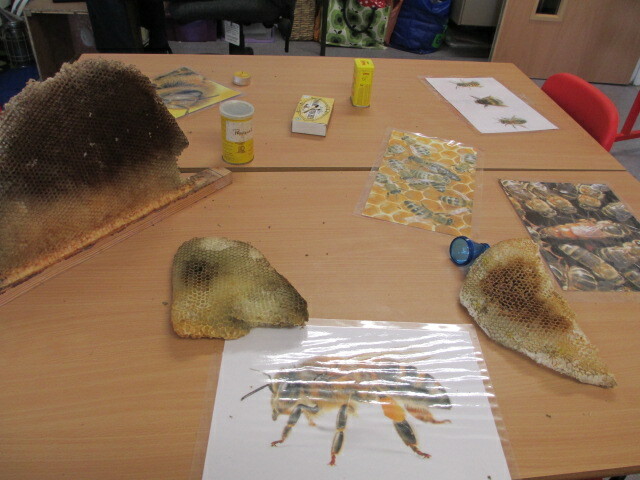 Then, with the help of two teachers, they were split into groups which visited three stations in turn; one for honey tasting, another to practice the waggle dance and the third to look at and feel the various props that Paul had lent me, including some comb, propolis and a prism viewer which shows the kind of multiple images seen through a bee’s eye. I also took along an old, empty WBC hive, which attracted a lot of interest. 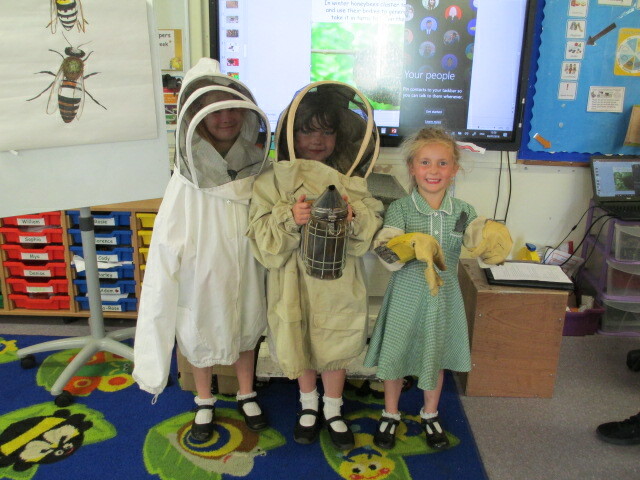 Finally, we discussed the risks to bees through man’s actions and disease, with their implications on the food chain. Habitat loss is particularly pertinent to Sutton Courtenay, an attractive old village backing onto the Thames, but which now has planning permission for 1000 new houses and two vast warehouses, rumoured to be for Amazon. It was a delightful, exhausting experience. At every pause a forest of hands was raised with questions. 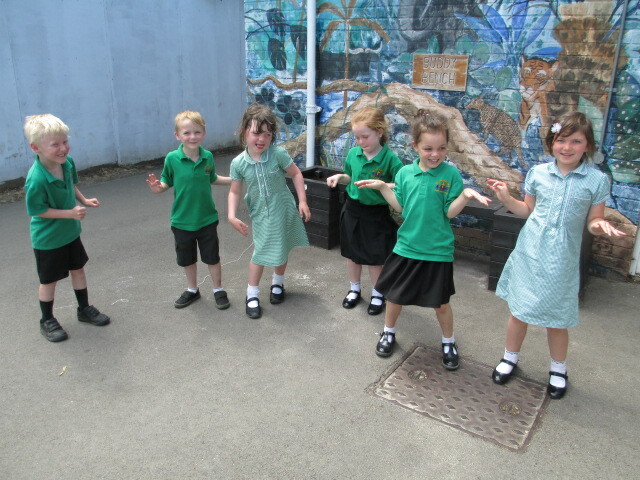 After a one-hour session with 20 Year 1 children I immediately had to repeat the performance for 27 Years 2s. At the end of it all a little girl came up to kiss me and demanded a kiss in return. It was never so easy in my courting days. Lovely and full of humour. I’ve done this to but with the 10 and 11 year olds. 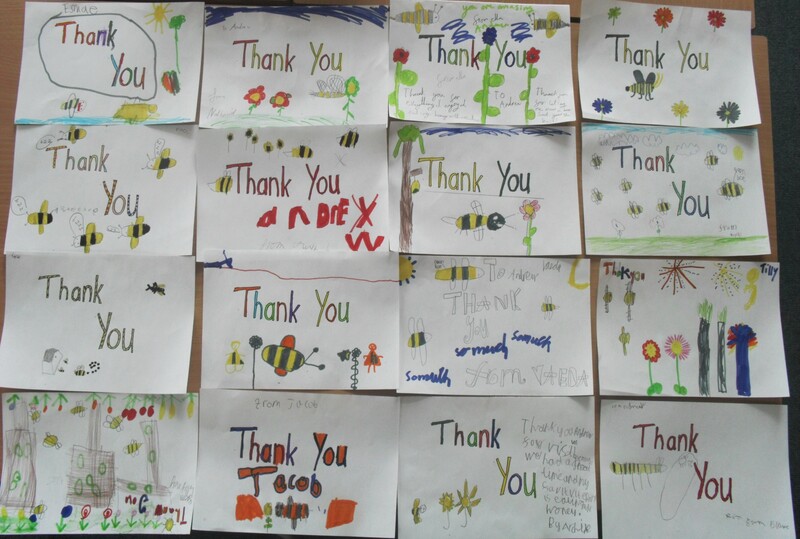 It does hit home with children, I meet kids who remember me coming to their school 5 years ago,to talk about bees. I had an observation hive with me as well. I took a tray with some food and some t shirts, jeans and flannels. We took away all the products that were influenced by healthy bees. Ending up with some dried pasta. No clothes made from natural fibers either. Apparently bees in some parts of the world pollinate cotton…. So if the worst case scenario does evolve say bye bye to jeans and t shirts too. I found that it taught me as a beekeeper a lot too in how important our responsibility is towards all pollinators.